Wall mount bathroom faucets are not reserved for contemporary bathroom design. If you love the look of your traditional bathroom, you can still update the room's look and feel by installing an appropriately designed wall mount faucet fixture. Moen's Kingsley wall mount faucets are the ideal solution for homeowners who want to preserve the traditional look and feel of their bathrooms while at the same time enjoying the modern luxury of a wall mount faucet system. 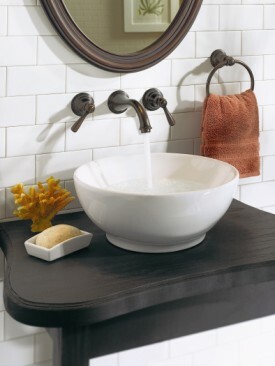 The Kingsley wall mount faucet is designed especially to coordinate flawlessly with traditional bathroom décor. The fixture's understated details are especially crafted to provide an air of traditional style that is both elegant and timeless. The spout is flared and the lever handles are beautifully designed, making this faucet the perfect wall mount solution for any decorating styles. You can choose from among several different finishes, ensuring that you'll be able to find a Kingsley wall mount faucet that coordinates flawlessly with your traditional bathroom design. You'll be pleasantly surprised to discover how easy the Kingsley wall mount faucet is to install. Typically, homeowners who choose to upgrade their bathroom design with Kingsley or other Moen wall mount fixtures are able to make the transition without having to replace any of the faucet plumbing. Moen's M•PACT® valve system makes changing out faucets nothing more than a simple matter of unscrewing the existing handles and spouts and replacing them with the new fixture. You can ensure complete coordination of your bathroom décor by adding accessories from Moen's design-matched suite of accessories made specifically to coordinate with the Kingsley wall mount faucets. You'll also enjoy the confidence of knowing that your new faucet is protected by Moen’s lifetime limited warranty. For more information, see www.moen.com or call toll free 800-BUY-MOEN.